Compatible with the full frame Pentax K-1 Mark II DSLR, new design offers a major update to the lens coating on the glass. A high-grade, multi-layer HD Coating is being applied to the optical elements which it is said produces high-contrast images with edge-to-edge sharpness, free of flare and ghost images. A highly stain-repellent SP Coating applied to the front surface improves the lens’ usability outdoors. The redesigned exterior matches the design of latest Pentax K-mount digital SLR models. The lens is constructed from six elements in five groups, with a 6-bladed diaphragm. The minimum focusing distance is 0.3m. The lens weighs in at 193g and measure 64x44mm. It takes 49mm filters. 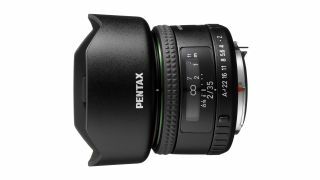 The HD PENTAX-FA 35mm F2 will go on sale from February, with a recommended retail price of £399.99 – which promises to make it less expensive than its predecessor. Pentax has simultaneously launched a new 11-18mm ultra-wide lens, designed to work with its APS-C range of DSLRs.